When I decided to spend a couple of weeks in Lima before moving to Chile, I knew I wanted to take advantage of my completely open schedule and sneak up the coast to Casma. I had read about the ruins at Sechín in Hugh Thomson’s fascinating book, A Sacred Landscape, and was curious about the gruesome carvings depicting beheadings, sacrifices, and soldiers. I hadn’t managed to make it there in 2013 so didn’t want to miss this opportunity to get back into the travel mode. I’d also heard that the nearby beach of Tortugas is one of the most beautiful in Peru, and decided to kill two birds with one stone. 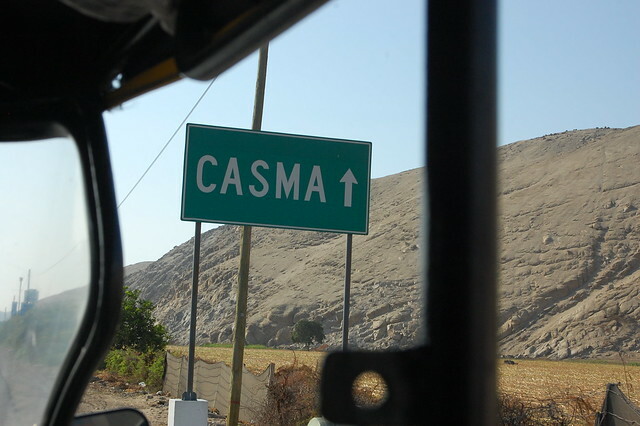 Casma is located about five hours north of Lima in the province of Ancash, but it can take some work to find a bus company that actually stops in Casma rather than continuing up the coast to Trujillo or inland to Huaraz. Alternatively, there are combis that hit the major towns on the coast and you should be able to find one that heads to Casma by stopping in one of the transit towns like Supe or Barranca. (More travel information in my recommendations, below.) 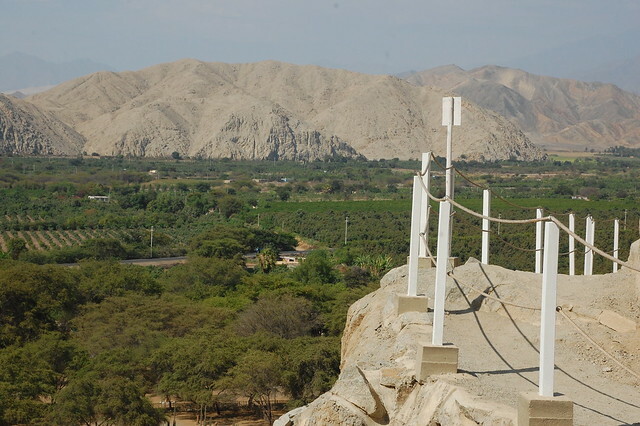 The ride up the Panamericana passes the entrance to Caral, and the scenery is consistent with the northern coast; the sea to one side, sandy desert hills to the other. 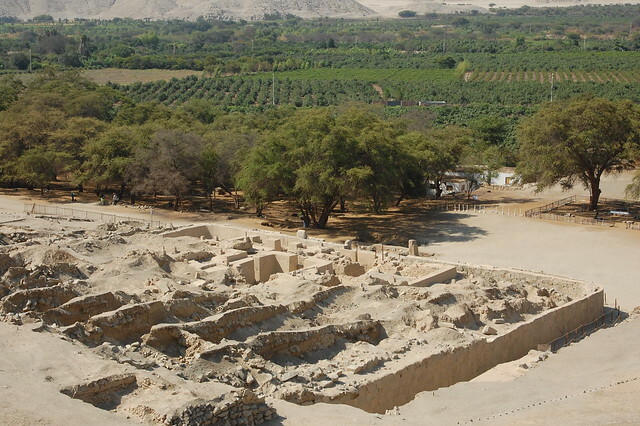 It’s worth mentioning that there are three archeological sites in the area: Cerro Sechín, which is commonly referred to as as Sechín, as well as Sechín Alto and Sechín Bajo, which are being studied but are not easily visited by casual tourists. There is also the Río Sechín, so it may help to specify “El Templo” (the Temple) or “El Museo” (the Museum) when discussing your destination. 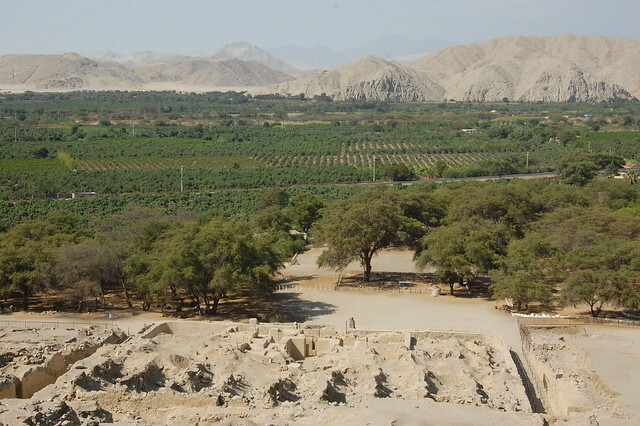 The archeological site of Cerro Sechín is located about 6 kilometers from Casma, and the easiest way to get there is to find a mototaxi willing to take you out to the site. At the site, the friendly guards directed us to the museum, where we paid our entrance fee and toured the sparse museum containing relics gathered from the major sites located in the area. From there, we walked over to the small set of ruins, following a well constructed pathway which provides great views of the surrounding landscape. 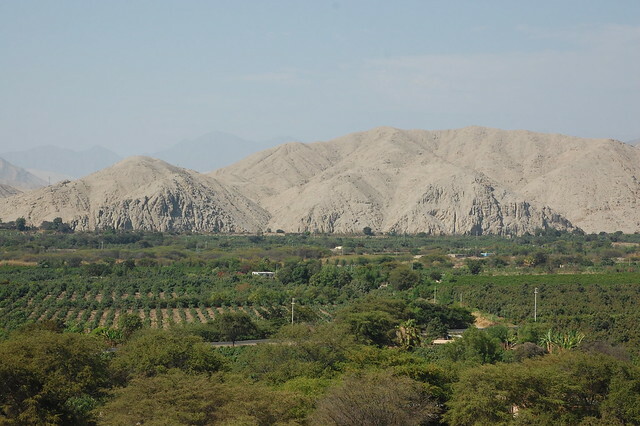 As in Trujillo and Chiclayo to the north, there are broad fields of green trees and patches of empty brown desert mountains. 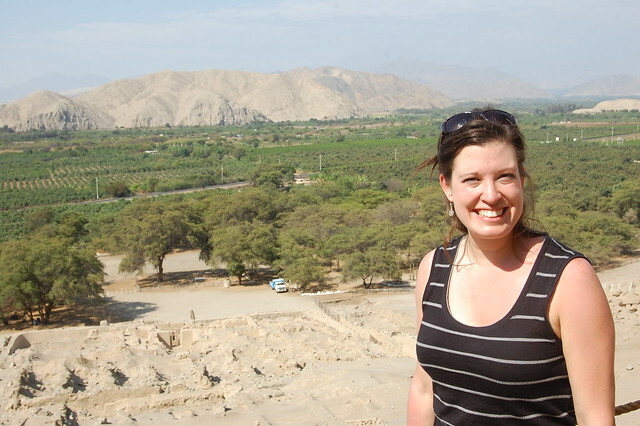 Taking in the scenery, I was reminded of how much I love northern Peru. The site of Sechín itself is very small and still under investigation. My friend Enzo and I were the only ones touring the ruins in the late afternoon sun, though we could observe a number of workers going about their daily routines below. Although it’s challenging to make out to the untrained eye, archeologists have determined that the site has one main building, surrounded by stones, and filled in the center with adobe structures. The hill above the site once had other residential or administrative buildings, which have been destroyed by heavy rains over the centuries. After completing our circuit around and above the ruins, we descended to get up close to the elaborate carvings depicting intriguing ancient ceremonies. 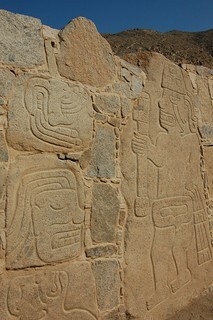 The images that line the entrance to the temple represent human figures, most likely warriors or perhaps priests, involved in what appears to be a fierce battle. None of the figures represent gods or other mythical creatures: just humans. 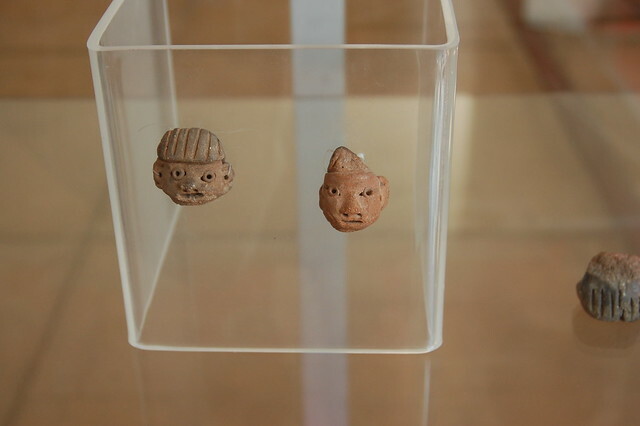 While some of the figures possess their entire bodies, there are also many disembodied heads and all kinds of body parts, leading many researchers to suggest that these carvings describe human sacrifice. Other ideas are that they record violent combats experienced by the Sechín culture, or even that all these different images of various appendages could represent a medical encyclopedia. Whatever the story, the figures show gritted teeth and swollen eyes, what appears to be blood or energy flowing out of their heads, grimaces and signs of suffering. In these photos, you can see some of the body parts, some of the complete figures carrying what appears to be weapons or holy staffs, and examples of the faces both in profile and head on. There are so many images that it’s difficult to really observe all of them, especially in the brutal sun of the northern desert. 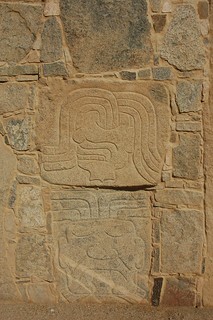 These images are located within pathways that appear to continue around the perimeter of the temples, telling stories. One big question mark for me after my visit is that these walls appear to be reconstructed. 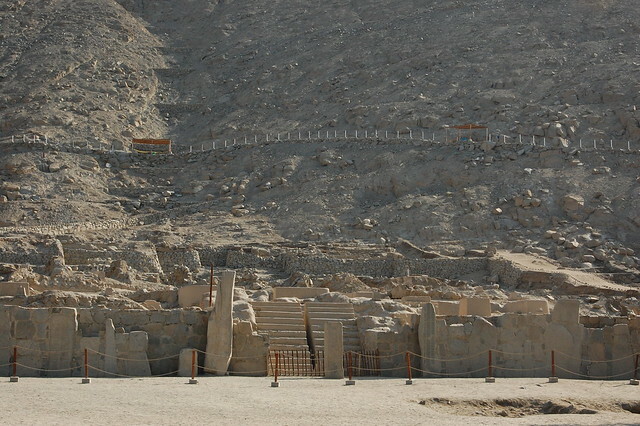 I’m not sure if these monoliths were found standing independently, and then archeologists reinforced the structures with like-colored stones and adobe, or if the walls had crumbled. I know from my visit to Caral that reconstructing original structures is a painstaking, detail-oriented process, and I learned at Chan Chan in Trujillo that previous preservation attempts actually meant re-carving and replicating the original images, which had deteriorated from the adobe walls after years of rain and wind. We wandered through the perimeter pathways, taking in all the different variations on what appeared to be quite a violent theme. I laugh when I see the photos of myself posing there because I appear to be enjoying my visit to what historically was likely a gruesome site. There is a lot to take in, and I applaud the authorities for making the images accessible to visitors even as they continue to study the ruins and unearth more information about what took place here. The visit ends in front of the entrance to the palace, which is off-limits to visitors. According to this fascinating article (in Spanish), the inside of the palace has painted adobe walls displaying images of fish, particularly carnivorous ones, as well as shamans and dead or dying human figures. 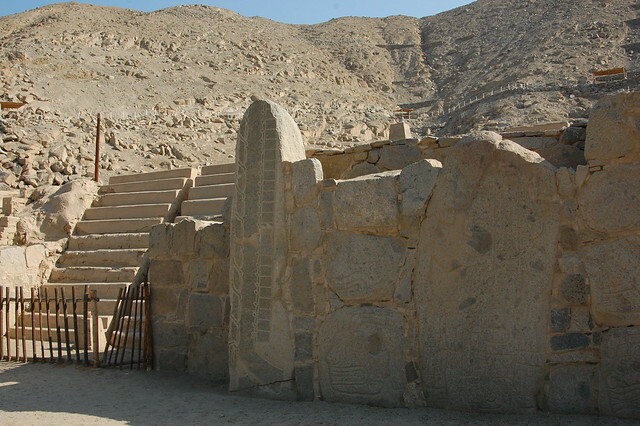 These images suggest some sort of connection with worship of the sea or concern regarding rainfall in this desert climate. In any case, my brief visit left me wanting more information about these ruins and the nearby sites of Sechín Alto and Sechín Bajo. (There are a couple of displays giving basic information about these archeological sites near the small parking lot where these mototaxis were waiting.) 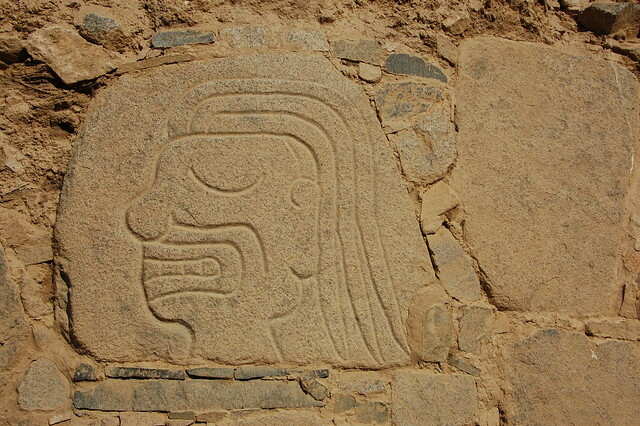 While many of the carvings have characteristics in common with the more well-known Chavín culture, represented in great detail at Chavín de Huantar (blog post forthcoming! ), it has been determined that Sechín came much earlier. 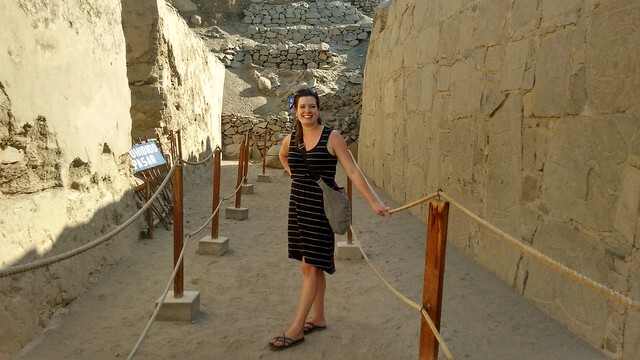 Visiting Sechín helped me place these ruins in my mental timeline of the pre-Incan cultures that once inhabited Peru. After finding the last mototaxi not waiting for one of the workers at Sechín, we headed back to Casma, enjoying the wind blowing in our faces as we passed through the agricultural fields along the hills. Back in Casma, we took a stroll through the pleasant plaza, grabbed a quick snack, and looked for the combis that would take us to Tortugas, a fishing village known for its beautiful bay. We had finished appreciating on of Peru’s ancient cultures for the day, and it was time to relax by the water. To get to Casma from Lima, take a bus to Casma using the company Erick El Rojo, which leaves from the Plaza Norte bus terminal in Lima. You can get to the bus terminal using the Metropolitano, so it’s pretty straightforward. In 2015, the buses left Lima at 7:30AM, 9AM, and 11AM, but you should definitely double check the schedule. Bring snacks – there is often traffic on the highway the bus stops frequently in urban areas to pick up more passengers. Alternatively, you can try taking a bus that is heading to Chimbote, Trujillo, or Huaraz and asking the driver to let you off at the crossroads to Casma. From there, you can take a mototaxi to Casma or to the ruins of Sechín. Your last option would be to take a bus or combi to Supe or Barranca and then find another combi to Casma. 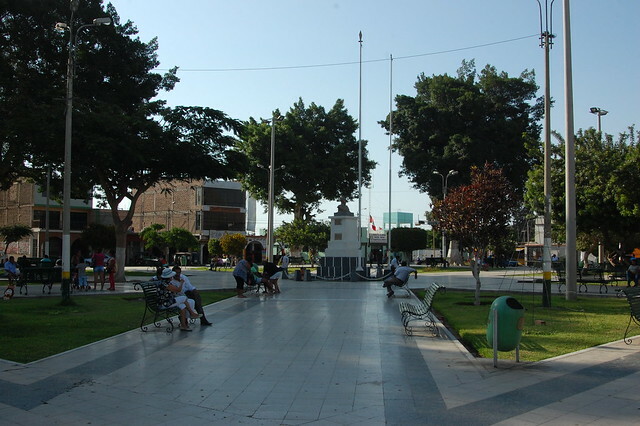 A good place to start would be to check with are Turismo Barranca and Turismo Paramonga, which also leave from the Terminal Terrestre Plaza Norte. 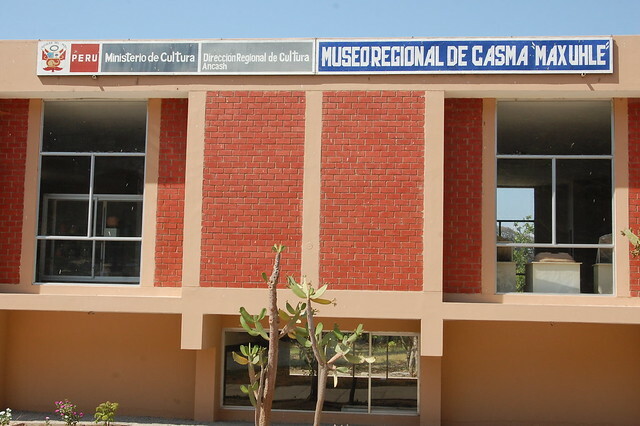 To get back to Lima, you can go to the office of Erick El Rojo on the main road entering Casma. We were able to book our bus back at the last minute, as the buses come from further north and pass through the town. The entrance fee to the ruins of Cerro Sechín cost me S/.5 in 2015, but I have seen the price listed as S/.6 in other locations. If you get off the bus in Casma, you will need to take a mototaxi to the ruins. This should cost about S/.5. 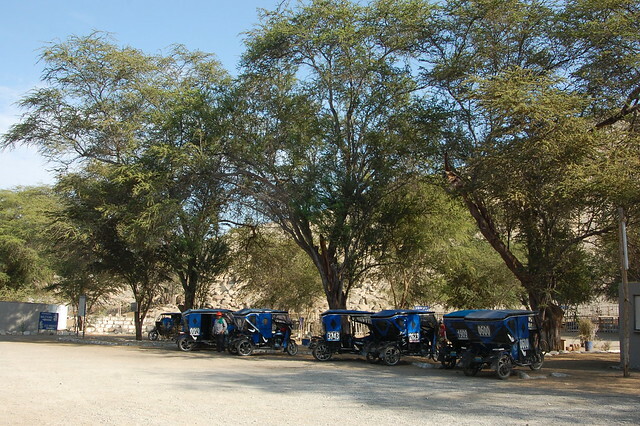 You can try asking the mototaxi to wait for you or return for you at the ruins at a set time. There are several mototaxis that wait for tourists – if it is late in the day, like it was for us, they will probably charge you S/.6. I’m not sure if the museum offers guided tours or if there are sometime guides lingering around, but there is no signage so it may be nice to try to find someone to give you some background. I had read about Sechín in Hugh Thomson’s A Sacred Landscape so had enough background to understand what I was seeing. 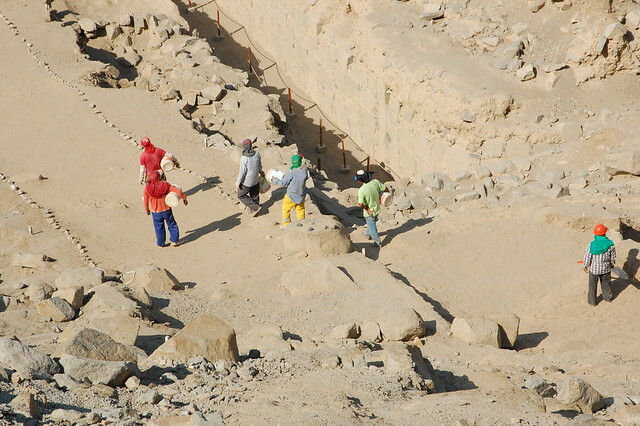 Having toured the larger, more popular ruins around Trujillo, I know how much a guide can help shed some light on the excavation and restoration process. 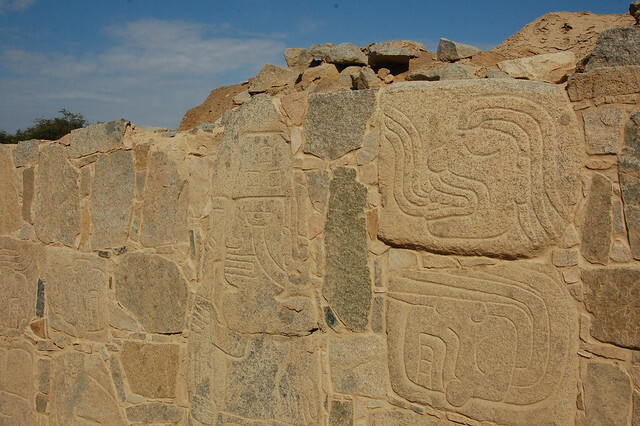 If you read Spanish, Wikipedia, Arqueotur, and Arquelogía del Perú (the most detailed and educational) provide some more information on the ruins, which helped inform my understanding a little more.